As defined in the Highway Capacity Manual HCM, Free flow speed (FFS) is” an average speed of vehicles on a given segment, measured under low-volume conditions, when drivers are free to travel at their desired speed and are not constrained by the presence of other vehicles or downstream traffic control devices. It is a parameter which has being utilized widely for limit and level-of-service investigation of different highway classifications. This research concerns collections and analyses free-flow data at the midpoints of forty-two multilane rural and suburban highway segments all through Al-Najaf city. Thus in order to predict FFS from corresponding collected values a, an extremely tests create model for evaluating normal free-low speed and for recognizing the appropriation of individual free-flow speeds. The most crucial variables that oversee FFS are vehicle type, space mean speed, and functional classification of highway. The subsequent models encourage the FFS rates of suburban and rural roadways. The Highway Capacity Manual (HCM- 2000) uses concentration approach to draw from its passenger-car equivalent factors (PCE) for heavy cars. These PCEs emerge like “ET” in HCM charts where ET is 1.5 for all urban highways and rural highways in level terrain. The harmonized traffic has being presumed by the density method and at the same time it has being typified by firm track system. By using the density method, it becomes possible to obtain more precise passenger car unit factors for Iraqi circumstances. The traveller vehicle unit factor (PCU) for trucks and buses is 2.0 in level terrain. According to Highway Capacity Manual (HCM) [1,2]. It can use two general methods to determine FFS for a multilane highway: field measurements and estimates which takes a geometric design and environmental condition available in its estimated FFS. Since field measurements are regularly not possible, another estimated FFS suggested in this research to use in HCM methodology depending on field available space speed. Free flow speed FFS represents a speed of a vehicle which it is movements not meddled by adjacent vehicles or conflict by control devices. The mean estimation of the FFS of individual vehicles could have been resolved whether as a time mean or as a space mean speed. "Time mean speed is defined as the average speed of all the vehicles passing a point on a highway over some specified time period. Space mean speed is defined as the average speed of all the vehicles occupying a given section of a highway over some specified time period. Both mean speeds will always be different from each other except in the unlikely event that all vehicles are traveling at the same speed. Time mean speed is a point measurement while space mean speed is a measure relating to length of highway or lane, i.e., the mean speed of vehicles over a period of time at a point in space is time mean speed and the mean speed over a space at a given instant is the space mean speed. Space-mean speed is the harmonic mean of individual speeds while time-mean speeds can be given as the arithmetic mean. It is important to mention that the testing techniques has adopted to measure space mean speed. Mean FFS possesses an extensive variety of utilization. For instance, space-mean free-flow speed can be taken as the premise of many arranging forms that are utilized average travel speeds and capacities . What's more, the evaluated travel speeds thus, are being utilized for assessing fuel utilization and vehicles emissions [3,4]. The U.S. Highway Capacity Manual  additionally utilizes space-mean speed broadly to dissect the limits and levels of service of open highways and urban and suburban arterials highways. Then again; all microscopic traffic simulation models need to utilize Time-mean FFS and its related appropriation of individual FFS as contributions for estimating travel time, delays, and fuel consumptions. Many researchers have investigated the problem of estimating free-flow speed [3,6-8]. Driver speed can be determined as an element of a many components separated from the posted speed limits, such as design speed, lane and shoulder width land use, alignment, surrounding land use, percentage of trucks in the traffic stream, traffic volumes, weather, time of day, enforcement , deceivability, car working attributes, and driver elements, for example, hazard taking conduct. Hence forth, it becomes hard to distinguish the impact of a single factor on speed. To discover the impact of alterations in speed limit by and large speeds, most analysts get depends on a correlation of average speeds prior to the adjustment in speed limit with average speeds subsequent to the adjustment in speed limit. Traffic survey is completed for critical streets, at the season of outline or at the season of up gradation. Depend upon this movement traffic survey and highway capacity level of service is surveyed. To arrive at a common type of vehicle, concept of Passenger Car Unit (PCU) sometimes also known, as “Passenger Car Equivalent” (PCE) was first introduced in HCM- 1965 to account for the effect of trucks and buses in the traffic stream (HRB,1965). The PCU definition in the most recent version of the Highway Capacity Manual (HCM) is ‘‘the number of passenger cars that are displaced by a single heavy vehicle of a particular type under prevailing roadway, traffic, and control conditions’’. Highway capacity, as defined by the HCM, is the maximum flow rate achievable at a specific location on a roadway under prevailing roadway, traffic, and control conditions. Several elements may have an influence on the FFS of a highway segment. They incorporate however, are not constrained to the spacing between signalized intersections, median, lateral clearance type, grade, curvature, speed limit, lane width, vehicle types, shoulder width, land use and drivers’ behaviors. The current paper concerns merely the FFS above straight and level sections that possess median barriers. It has been selected Forty two of similar sections to b be employed by this paper by the help of Al-Najaf and Kufa municipalities. Every section be positioned amid signalized intersections. FFS of vehicles had been measured with moving vehicles observer technique along every section of reasonable climate circumstances. Vehicles had been categorized to passenger car, single unit trucks, and buses. Field surveys on vehicle classification counts and speed were complete for a total of 21 survey locations in the Najaf city. The lane width, shoulder width, and driver population are important parameters in selecting highway location samples. The main purposes of these surveys are to estimate free-flow speeds, to update vehicle classification traffic counts and to investigate volume-delay relationships for the study area. Data was collected in 15 minutes time periods for a of 4 hours (7:30-11:30) in winter months (December and November) on Monday, Tuesday and Wednesday in 2015. The surveys were conducted with observer moving car method at the survey spot. The counters can instantly record space mean speed, traffic density and classification data. The principal central freeway operational categorizations include three types: arterial, collector, and local roads. All roads and freeways have been assembled into one of the aforementioned categories, based upon the feature of the movement (i.e., neighborhood or long separation) and the level of land get to that they permit. These arrangements are depicted in Table 1. Table 1. Description of operational categorization systems. Arterial Provides the highest level of service at the greatest speed for the longest uninterrupted distance, with some degree of access control. Collector Provides a less highly developed level of service at a lower speed for shorter distances by collecting traffic from local roads and connecting them with arterials. Local Provides a less highly developed level of service at a lower speed for shorter. Ordinarily, explorers will utilize a blend of arterials, collector, and nearby streets for their voyages. Every kind of street possesses a particular reason or capacity. Some give area get to serve every ending of the trip, while others give travel portability at different grades, which is required in path. The Functional Classification system can be additionally separated into "suburban" and "rural" categorizations, and there are sub-orders inside these groupings too (Table 2). Figure 1 display more description data, could display in Highway Functional Classification: Ideas, Criteria and steps . Table 2. Vehicle space mean speeds from survey locations. Figure 1: Functional classification of highways. In its definition, FFS refers to the speeds which happen while density and flow are equal to zero. Thus, factors determining FFS only involve geometrics of the street along with posted speed without any interference by traffic, signals, weather or accidents. 21 locations were selected based on their survey location, area type, traffic volume at the time of survey and space mean speed compared to the posted speed. In selecting those locations for analysis, the following criteria to determine the free-flow conditions were used based on the (HCM 2000): multi-lane highways: mean speed of traveler vehicles that expose little to modest flow conditions (up to 1,400 pcphpl). Table 3 indicates FFS and speed differential measured at survey locations. It should be noted that the FFS values has been recorded at night time hours since this time being very few traffic sizes times gives the driver free access without impediments or interferences with traffic. Table 3. Free flow speed and speed differential from survey locations. 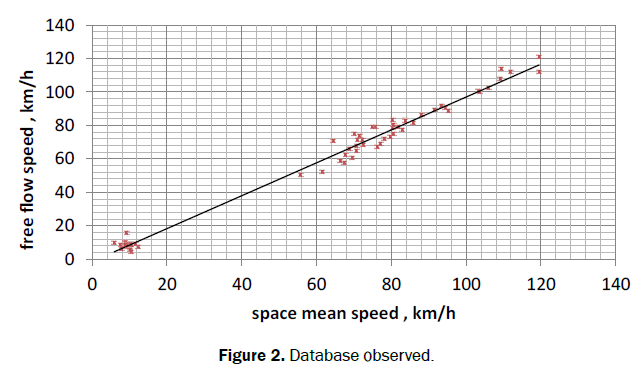 According to study results the base free flow speed can be estimated unless measured flow speeds are available as follows: base free flow speeds are 75 km/h and 105 km/h for urban and rural highways correspondingly, where the freestream velocity equals to 5 up to 15 mph quicker from the space mean speed for both rural and urban highways. Dowling et al. investigated the velocity information out of 10 velocity assessment locations on four rural highways that are within three districts . Those researchers established the relationships between FFS and speed limit : regarding to displayed speed limit exceeding 50 mph, the FFS = 0.88* displayed limit speed + 14 , while regarding the displayed speed limit smaller of or equivalent to 50 mph, the FFS= 0.79*Posted limit speed + 12. The guidance provided in the HCM (TRB, 2000) and by the aforementioned researchers indicates that speed limit is likely correlated with FFS. With the exception of the guidance provided in Chapter 10 of the HCM, there is a trend where the FFS equals 5 to 7 mph quicker from the speed limit. The validation of the model considered data from a subsection of 42 sites which were not involved in the dataset used for model calibration. Figure 3 relates measured FFS to FFS calculated using the projected model for the same 42 sites in another survey whose data were used in the validation of the model. The average error was found between the observed and corresponding estimated FFS was 1.4 km/h that indicated by standard error equal to 0.0533. Numerous strategies are found for deciding passenger-car equivalents (PCEs), passenger car units (PCUs) or the homogenization coefficient. These strategies can be given as the semi-experimental strategy, Walker's technique, progress technique, different straight relapse technique, and the reproduction technique [11,12]. In the homogenization coefficient technique, looking at hypothetical most extreme limits as distinctive vehicle sorts only utilize the street produces PCUs. The strategy thinks about the 'all traveler auto' and 'all other than traveler auto sort' limit of movement paths. Walker's strategy  constructs PCUs with respect to over takings that the movement sort would perform per kilometer length of highway if every car proceeded at its typical velocity. The proportion of over takings when activity contains one moderate moving car for every hour to over takings once movement has traveler autos of equivalent volume ascertains traveler auto units. The idea that a substantial car possesses more space than a traveler auto and diminishes limit shapes the premise of the progress strategy. Investigation of time degrees of progress of a solitary stream of cars in a unit amid crowded circumstances could decide limit based PCUs. Notwithstanding, figuring PCUs in light of the proportion of degrees of progress does not create direct outcomes; a few methodologies for deciding types of progress exist. Plots of separating against progress are able to create PCUs. Additionally, a plot of velocity against types of progress of solitary cars by entering bends at steady velocities could figure PCUs . Bang et al. have made assessment of PCUs to street connections and township streets in Chinese republic via utilizing the relapse technique . Relapse investigations created velocity-based PCUs utilizing 5-minute, normal velocity and stream information from destinations with adequate streams to demonstrate a critical velocity diminishment at expanding stream. The relative impact of various car sorts in a blended activity stream on the velocity of light cars fills in as a foundation for identicalness. The investigation of the proportion amid the relapse coefficient for a particular car sort and that for light cars created last PCU esteems. Bang et al. built up a reenactment technique for deciding PCUs by utilizing the VTI recreation form. The reenactment strategy creates PCU esteems via progressive recreations concentrate the effect on light car velocity at the presentation of other car sorts in the activity flow . Webster and Elefteriadou evaluated traveler auto counterparts for substantial cars through utilizing recreation in view of activity concentration . The review examined the impact of a few attributes identified with road plan, car execution, and the movement stream on traveler auto reciprocals for substantial cars. Movement thickness demonstrates a decent marker of the driver's opportunity to move, a precise measure of nearness to different cars, and reliable with the measures of viability for turnpikes and multi-path freeways utilized as a part of the Highway Capacity Manual. New PCU esteems in HCM 2000 originate from Webster's and Elefteriadou's work. PCU values gotten from the thickness technique utilize basic homogeneous movement ideas, for example, strict path train, auto taking after rationale, and a vehicle armada whose components don't change much in physical measurements . Homogeneous movement speaks to an extremely limit instance of heterogeneous activity. Indian freeways convey non-homogeneous activity, which regularly incorporates nonmechanized activity substances. Free path train wins; path driving and auto taking after is not the standard. Strategies in light of homogeneous activity ideas had constrained appropriateness for this non-homogeneous movement. One can equivocate the density of trucks to the density of passenger cars under homogeneous conditions to find the PCUs for trucks. Here kcar stands for the concentration of vehicles within unadulterated homogeneous movement (cars/km), ktruck represents the concentration of trucks in unadulterated homogeneous movement (trucks/km) and PCUtruck stands for the passenger-car unit for trucks given homogeneous traffic behavior. Field measurements were carried out to determine the density values of cars and trucks . The regular spaces or concentration of trucks alter relying upon the rating along with extent of the rating as stated by the U.S. Freeway Capacity Handbook (TRB, 2000). For unchanging overhauls, PCU truck could move up to high of 15.0. On unchanging minimizations, PCU truck could move up to high of 7.5. Nonetheless, all Al-Najaf test destinations depend upon the level territory; the impact of rating and rating size is unimportant. Table 4 demonstrates the traveler auto units for trucks and buses . Table 4. Passenger car unit for trucks and buses. As it is reported in table above, the average value of passenger car unit factor (PCU) for trucks and buses is 2.0. 1. The developed model (FFS=0.96 SMS +11.8 ,R2=0.995 ) can be used to estimate free stream velocity based upon spacing mean velocity measured within certain segment of multilane. 2. According to study results the base free flow speed can be estimated unless measured flow speeds are available as follows: base free flow speeds are 75 km/h and 105 km/h for urban and rural highways correspondingly. Also, the paper results indicate that FFS is 5to 15 mph quicker from the spacing mean velocity for both rural and urban highways. 3. Based on the study results, the passenger car unit factor (PCU) for trucks and busesis 2.0. 1. It is urgent to examine the influence of grade above the FFS and passenger car unit factors. 2. There is a need to conduct a study of estimation of passenger car unit factors for heterogeneous traffic. GR Andrade and JR Setti. Speed-Flow Relationship and Capacity for Expressways in Brazil. TRB 93rdAnnual Meeting Compendium of Papers. 2014;1-18. GR Andrade and JR Setti. Method for Characterization and Classification of Homogeneous Roads. Annals of the 7th Brazilian Congress of Roads and Concessions. 2011;14. R Dowling, et al. Planning Techniques to Estimate Speeds and Service Volumes for Planning Applications. Transportation Research Board. 1997. S Teply et al. Canadian Capacity Guide for Signalized Intersections. Institute of Transportation Engineers. 1995. Transportation Research Board. Highway Capacity Manual. National Research Council. Washington D.C. 2000. KR Agent, et al. Evaluation of Speed Limits in Kentucky. Transportation Research Record No. 1640. Transportation Research Board. 1998;57-64. KK Dixson, et al. Posted and Free-Flow Speeds for Rural Multilane Highways in Georgia. ASCE Journal of Transportation Engineering. 1999;125. M Kyte, et al. Effect of Environmental Factors on Free-Flow Speed. Transportation Research Circular E-C018: 4th International Symposium on Highway Capacity. 2000. CG Wilmot and M Khanal. Effect of Speed Limits on Speed and Safety: A Review. Transport Reviews. 1999;19:315-329. AASHTO. A Policy on Geometric Design of Highways and Streets. American Association of State Highway and Transportation Officials. 2004. Road User Cost Study in India. Central Read Research Institute. 1982. LR Kadiyali and E Vishwanathan. Study for Updating Road User Cost Data. Journal of Indian Roads Congress. 1992;54:645–731. WD Cunagin and CJ Messer. Passenger Car Equivalents for Rural Highways. US Department of Transportation. 1982. WR McShane and RP Roess. Traffic Engineering. Prentice-Hall, Englewood Cliffs. NJRoad Accidents in Delhi 2004 Accident Research Cell. Delhi Traffic Police (New Delhi, India). 1990. KL Bang, et al. Traffic performance and passenger car equivalents for road links and township roads in PRC. Proceedings Third International Symposium on Highway Capacity. 1998;257–273. KL Bang, et al. Development of Speed-Flow Relationships for Indonesian Rural Roads using Empirical Data and Simulation. National Academy Press. 1995. N Webster and L Elefteriadou. A Simulation Study of Truck Passenger Car Equivalents (PCE) onBasic Freeway Sections. Transportation Research Part B: Methodological. 1999;33:315–385. S Cafiso and G Cerni. New Approach to Defining Continuous Speed Profile Models for Two-Lane Rural Roads. Journal of the Transportation ResearchBoard. 2012;157–167. Highway Research Board. Highway Capacity Manual. National Research Council. Department of Traffic and Operations. Special Report 87. Committee on Highway Capacity. 1985. NJ Garber and LA Hoel. Traffic and Highway Engineering. Cengage Learning. 2009.